Stability balls. You’ve probably used them for ab exercises. You may even own one of your own. What you may not realize is that they’re good for more than just crunches. You can work your whole body with nothing more than one of these large inflatable balls and a simple set of dumbbells. 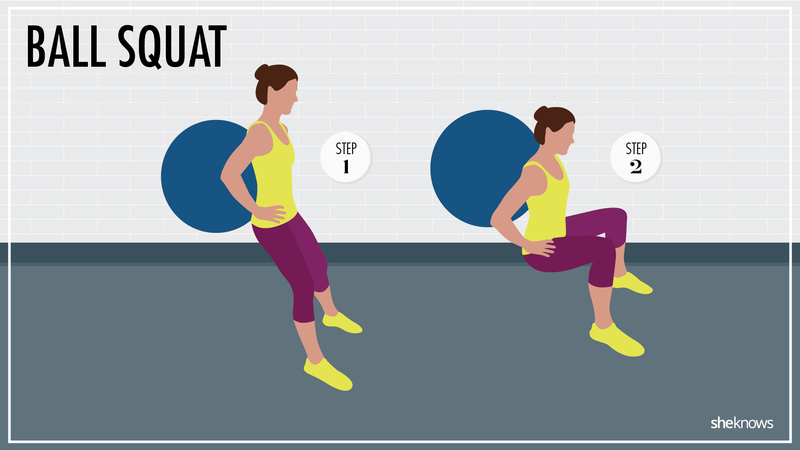 This straightforward circuit routine will take you less than 30 minutes to complete. Cycle through 15 repetitions of each exercise for the first circuit, rest for two minutes, then perform 12 repetitions of each exercise, rest again, and perform one more round of 10 repetitions of each exercise. Just remember, when performing exercises such as the unstable dumbbell row and stability ball lunges, you’ll have to perform your repetitions on both sides before moving on to the next exercise. Place the ball between yourself and a wall so the ball is at your midback. Step your feet out slightly so you can lean into the ball. Bend your knees, and lower your hips toward the ground as the ball rolls up your back. Keep your weight in your heels. When your knees are bent at, or slightly below, 90 degrees, press through your heels, and return to standing. Hold a dumbbell in your left hand. Using the stability ball as an unstable bench, place your right hand on the center of the ball, and use your right knee to help hold it steady. Step your left leg behind you so your body forms a diagonal line. With the dumbbell hanging straight down from your shoulder to the left of the ball, engage your back, and squeeze your shoulder blades together as you bend your elbow and draw the dumbbell straight up to your body. Reverse the movement, and lower it back to start. Complete all your repetitions on one side before switching to the opposite side. 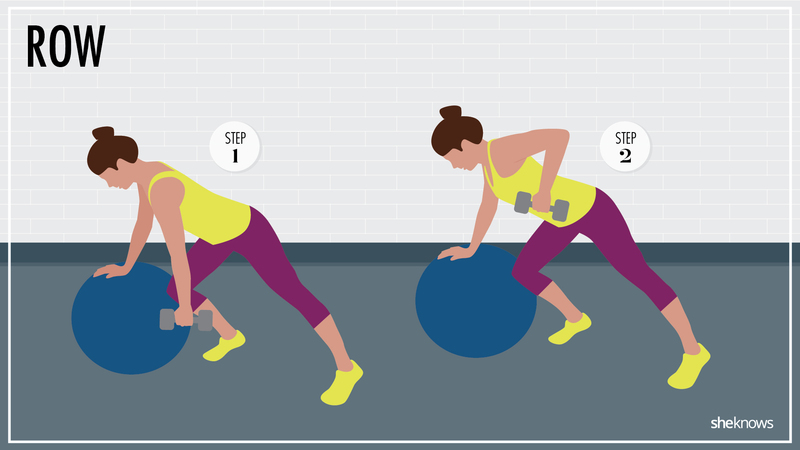 Stand about a foot in front of the stability ball, feet hip-distance apart. Bend your right knee, and place the top of your right foot on top of the ball. Take a moment to center your foot and make sure you’re sufficiently balanced on your standing foot. 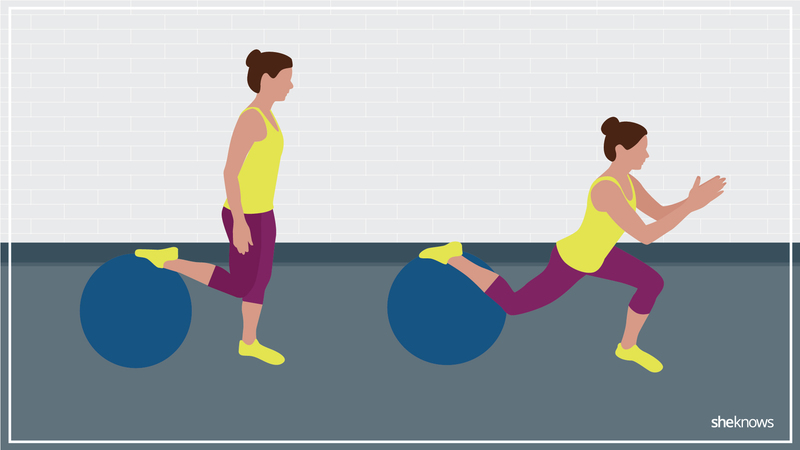 Keeping your weight in the heel of your left foot, bend your left knee, and begin rolling the stability ball behind you as you extend you right leg backward. Keep your torso upright as you drop your hips straight down, making sure your left knee doesn’t extend in front of your left toes. Press through your left heel, and extend your left knee as you return to start. Perform all of your repetitions on one side before repeating on the other. Stand in front of the stability ball. 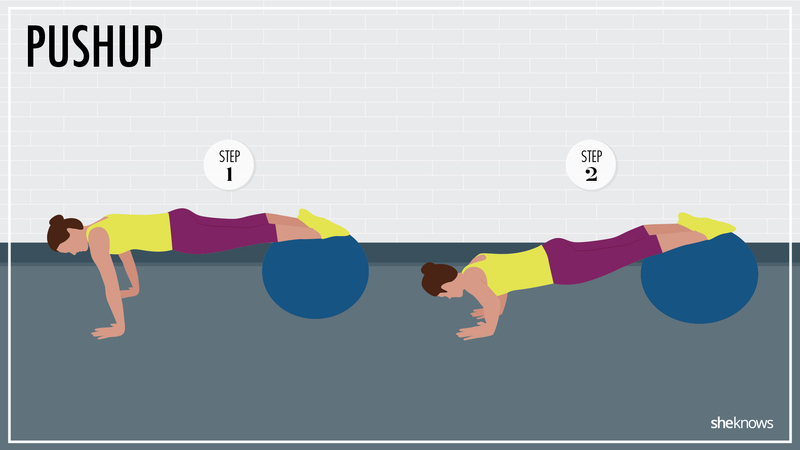 Crouch down, and place your hands on the ground for support, and then place one leg and then the other on top of the stability ball. Take a moment to adjust your positioning. You want your body to be in a full plank position: palms beneath shoulders and hips flat so your body forms a straight line from heels to head. 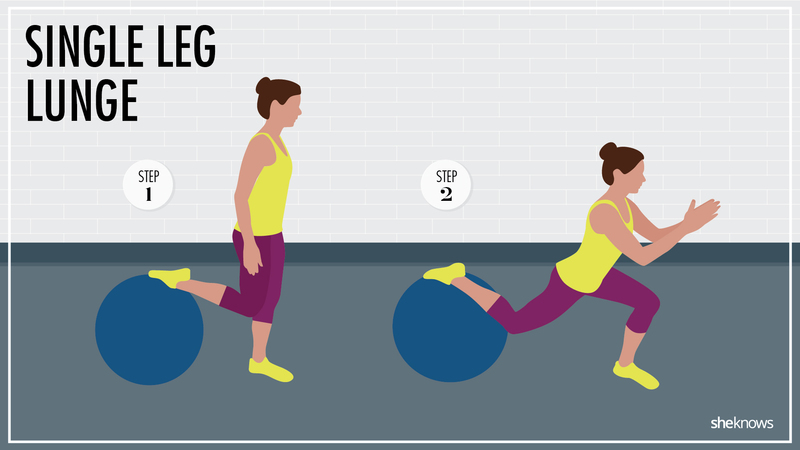 You can place the stability ball anywhere along your legs for support. The closer it is to your hips, the easier the exercise will be. Keeping your body straight and core tight, bend your elbows, and lower your chest toward the ground. When you’ve gone as far as you can, reverse the movement, press through your palms and return to start.